StyleNest have discovered the cutest and brightest children’s pyjamas, The Bright Company. Getting the kids to sleep can be a source of horror for many parents. However, ensure your little one is at least dressed and ready for bed in one of the fantastic designs from The Bright Company online. The Bright Company was founded by Alienor Falconer, in the summer of 2012. She has garnered experience in the fashion industry, working as a product developer, most recently for acclaimed British brand, Paul Smith. Alienor is a supporter of British industry and The Bright Company work exclusively with UK-based partners in print and production. The sleepwear itself is designed to fit the needs of your wriggling little monster; boy and girl, as all the products are unisex. The Bright Company focuses on, as the company name suggests, strong block colours and graphic prints, veering far away from the traditional notion of pink for girls and blue for boys. StyleNest are huge fans of the Slim Jyms pyjama sets, which come in an array of designs; from bold patterns in mustard and teal, to stripe and mint and also colour blocking style. The cotton interlock jersey fabric used to make the pyjamas is a stretchy knitted fabric, which allows movement and growth whilst also retaining its shape. All products are individually hand made in the UK. The handy selection of blankets are also stylish yet practical. 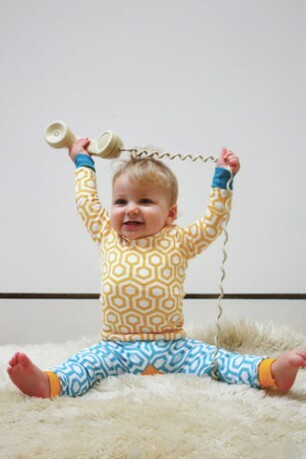 All designs are one-offs and the cotton interlock jersey fabric used is the same stretchy knitted fabric used for the Slim Jyms pyjamas – providing stretch if used as a wrap or a tucked in blanket whilst still keeping its shape. Head to Thebrightcompanyonline.com to see the gorgeous selection of sleepwear for yourself, all available now. Click here to see the best of little girls nightwear gallery.